I love potato salad, it is a great summer dish, substantial without being heavy, and it keeps well in the fridge, ready for when you can’t be bothered cooking. Even after being kept in the fridge it refreshes really well with an extra tablespoon of dressing added to the salad. 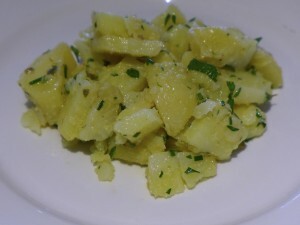 Most potato salads are usually dressed with mayonnaise, but I like this lighter version made with a mustardy, herby vinaigrette. It really relies on good ingredients, the right kind of waxy potato and good fresh olive oil and herbs. Some of the more readily available waxy potatoes are Dutch Creams, Nicola, Kipfler and Bintje. Probably the ultimate waxy potato salad potato is the Pink Fir Apple, I have grown them and they are amazing, but pesky to peel and I have never seen them in the shops. I always have Dutch Creams in the house. I love their beautiful yellow flesh. So that is what I used. I recently made this for my Mum’s birthday dinner, it was a hit, with everyone going for second helpings.